Defender Skin is a protective padded athletic tape. The light, flexible and extremely versatile second skin helps protect athletes against scrapes, cuts, bruising, and other abrasive injuries commonly associated with impact during sports. Defender Skin is a breathable adhesive that also absorbs impact and distributes it throughout tiny pieces of padded foam which acts as padding. This padded athletic tape is popular among football, basketball, lacrosse, baseball, hockey, and rugby players. Fitness enthusiasts use the protective tape to shield their knees and elbows through yoga, bootcamp workouts, tabata exercises and more. Defender skin can also be used for outdoor sports, action sports, endurance races, or any type of activity where you need skin protection. You can see some of your favorite NFL and college football players sporting Defender Skin for protection in place of traditional padding. Total Impact Protection- Tiny protective foam pads on the athletic tape help absorb and cushion the impact you may experience in rigorous sports and disperses energy horizontally to reduce impact on the body. Abrasion Defense- Provides a thin second layer of protection for your skin against dirt, rocks, grass, turf, and more including chafing and blisters. Defender Skin can also be used to help protect healing wounds, cuts, and scrapes as you continue your activities. Comfort- Move freely and without restriction. The protective tape stays on and is breathable allowing oxygen to pass through. Easy Application- After you cut the padded tape to your desired size, peel off the backing, and apply to any area of the body. Clean your skin with alcohol and/or shave the area to allow for maximum adhesion. Apply 45 minutes prior to activity for best results. Versatile Total Body Coverage- Protect any part of your body subject to abrasion and impact during your sport. Cover your knees, shins (or side of your legs), elbows, forearms, shoulders, and more. All-Sport Usage- Team sports, endurance, outdoor sports, fitness, action sports. The sports and activities you can use Defender Skin for is limitless. Color- Currently only available in Black. 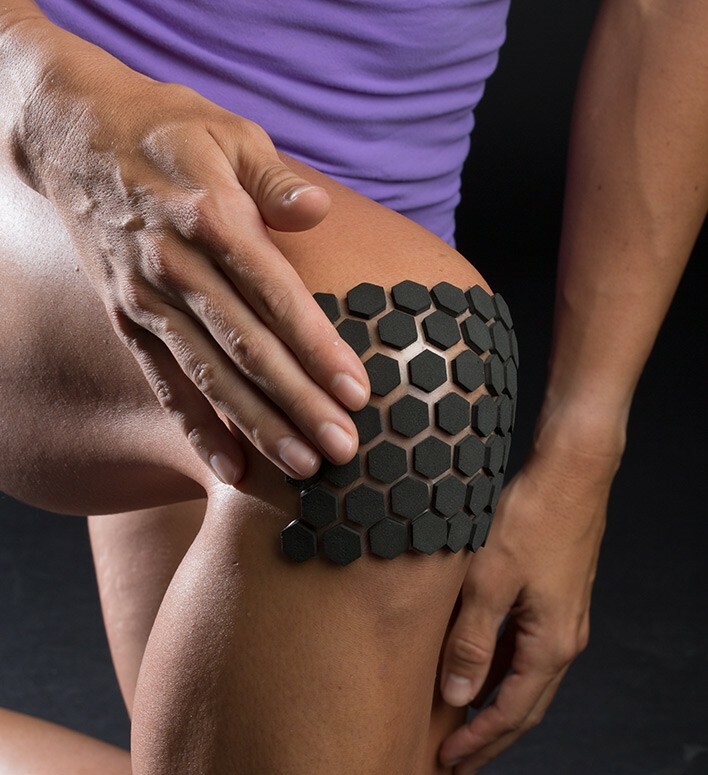 I'm a soccer goalie and I'm wondering if I could use this on my hips to prevent turf burn when diving. I also hurt my shoulder a year ago, dislocating it. I'm wondering if putting this on my shoulder could soften the impact when I dive. The material composition of our Defender Skin product consists of a polyurethane tape, adhesive, and neoprene. Please refer to clinical summaries for both the tape and adhesive. The neoprene foam is synthetic rubber based and to the best of my knowledge will not cause a reaction for those allergic to the proteins present in natural rubber latex, e.g. "Synthetic rubbers such as elastane, neoprene, and artificially synthesized polyisoprene latex do not contain the proteins from the Hevea brasiliensis tree"
I used the protective tape twice. The first time I placed them on my upper chest (just around the neckline), I was comfortable doing fast reps of power cleans. I believe the pads prevented some bruises that I normally get when doing similar CrossFit movements. I was sweating and the pads stayed on really well. Second time I used the pads on my knees and forearms during flag football. They were intimidating; however the pads didn't stay on very well when I made contact with the ground. I would suggest these are great for workouts but not with hard contact sports. Maybe offer different kinds of adhesive. Returned to volleyball post acl recovery with the don joy active brace, however no knee pad would fit under it. So tried the defender active skin. After a few attempts, figured out the best way to make it stay in position on the knee. First always use a germ or alcohol wipe first and let dry, then apply and cover with a compression sleeve to make a knee pad. Don joy please make a knee pad that will work with your active brace for post knee surgery.